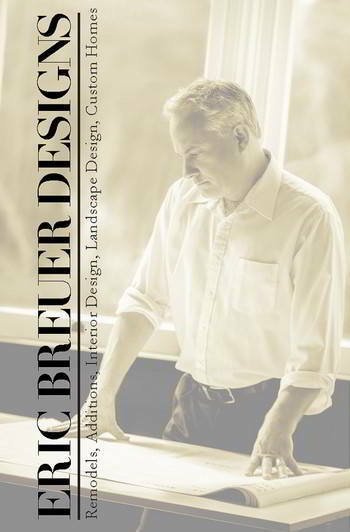 <> Eric Breuer Designs is a multi-disciplinary design studio covering all phases of interior and exterior residential and commercial design. We cover new work and remodels. From whole custom homes, to kitchens & bathrooms, to cabinet design, to landscape design. Whether it's a little job, or a big one, we're here to help guide you through the process of design and permit submittal. We use world renowned 3D architectural package, Chief Architect, so you can see your design come to life in 3D right n front of your eyes. No more doing mental gymnastics to visualize your new home or remodel, see it right there on the screen, or see it in 3D online! 3D design allows us to quickly and efficiently get a working design together. Let us show you the future of design! I've had over 30 years' experience in Residential and Commercial architectural design, construction, and drafting. I completed my Masters in Interior Design from Florence Institute of Design International, Florence, Italy, and have also held a California C-33 Painter & Decorator license since 1999. Copyright © 2015 - 2019. Eric Breuer Designs. All rights reserved.